Social relationships work because there is a mutual knowledge of certain elements like status and age, that require different degrees of politeness. The way we express politeness and formality in Italian is clearly marked by the use of tu and lei. Being able to discern when it is appropriate to use one or the other will speak for you, will give an impression of who you are and how you can engage with other people. It is your politeness business card. 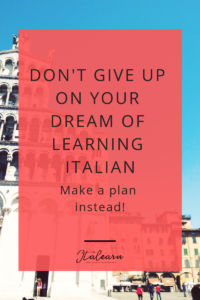 It is not always easy to decide what’s the best form to use and many Italians have their personal way of looking at this, but I have outlined a few general examples that can help you make a more conscious choice, dare del tu or dare del lei? Vai a comprare il pane? Are you going to buy bread? Vai tu a comprare il pane? Are you going to buy bread? Not me, or anyone else? The first sentence could go on like this: vai a comprare il pane? Prendi anche mezzo chilo integrale > are you going to buy bread? Get half a kilo of whole wheat, too. In this case we take for granted that the person we are talking to is going to do the action. The second sentence could go on like this: vai tu a comprare il pane? Io sto preparando il pranzo e tua sorella è ancora a scuola > are you going to buy bread? I am preparing lunch and your sister is still at school. In this case we are both asking and implying, at the same time, that you are the one who is going to do the action. Now let’s use the same example to fit our purpose. If you happen to listen to a conversation like this in real life, you probably have all the elements to understand the use of tu, because you already know how the speakers are related. The same goes if you read the sentences in a book or any other piece that has a context you already know. So from a general situation you are able to draw a conclusion: the relationship between the two speakers is a very close one, they are relatives or friends, so they use tu. This is the first general rule of tu/lei: with relatives, friends, people you know well, use tu. 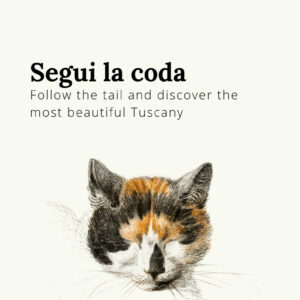 There are more social circumstances where you can use tu even if you don’t know the other person, for example when you go to shops with a very informal atmosphere (I’m thinking H&M vs Ferragamo boutique), or pubs, cafes, restaurants that are very friendly and familiar (here I would say Starbucks and your fav pizzeria vs Massimo Bottura’s Osteria Francescana, that has 3 Michelin stars). At work, you will use tu with your colleagues, especially if you are at the same level. If you are friends with a supervisor or a colleague in a higher position, of course you can use tu, but it would be more appropriate to switch to lei when there are other colleagues. The use of tu has now been extended to areas/situations where lei was used, for example at school, elementary/primary level, students use tu with their teachers. This is less common in high school, though it really depends on the single teachers. Lei is the formal and most respectful way to talk to seniors and in general to people older than you. Even if you get to know the person more over time, it is still a good practice to continuing to use the lei, it doesn’t add distance, you can actually be very close but talk more formally. 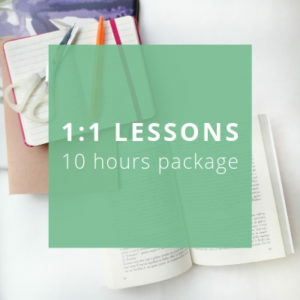 At work there are many situations where the lei is compulsory: the higher the position in the company, the more likely you are to give a negative impression if you use tu. Needless to say, if you are doing a job interview, never use the tu, even if the interviewer is younger than you. Nothing says “unfit for the job” more than not being able to understand that an interview requires a high degree of formality. From the point of view of new learners, who do not make the distinction between formal and informal you in their native language, it seems the issue has little relevance. 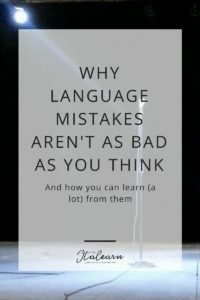 On the contrary, from the point of view of native speakers, it says a lot about your level of politeness and your knowledge of social etiquette. So if you want to have good social relationships, take a moment to think about who you are talking to and in which situation you are acting and decide if it’s ok to use tu or lei. As a general rule, keep in mind that people you don’t know (and who are older than you) will expect you to use the formal lei, even if you are just asking for directions in the middle of a crowded street. You will also use it when talking to a person representing any authority or specific social position like police officers, bank employees, mayors, professors, doctors, etc. One note: it is always the older person or the one in the highest position to allow the use of tu. 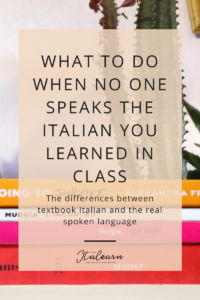 So for example, the professor can say to the student “diamoci del tu”, or your boss can tell you “chiamami Mario, senza troppe formalità”. 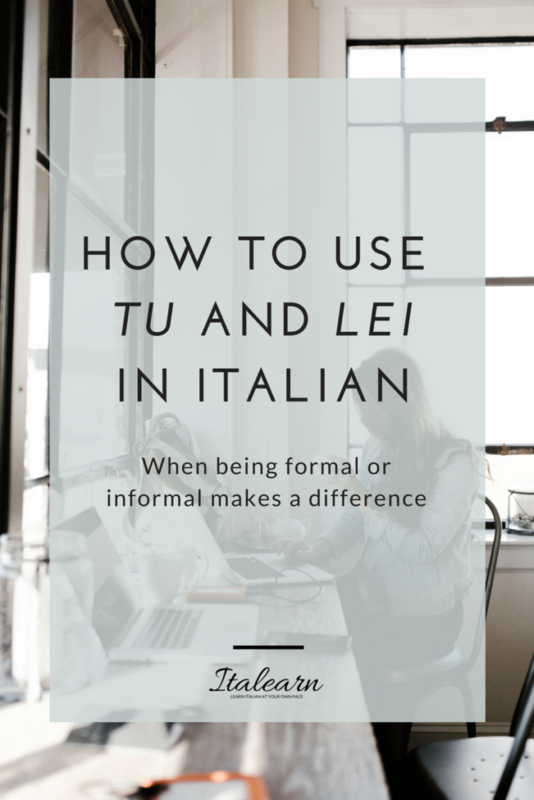 Here is an infographic that recaps all the most common situations where you need to make a choice between tu or lei, formal or informal. Sometimes the graphic medium is more effective than a lot of words, if you are the visual type, like me, you can appreciate some color to show you your way around things. Now that you know when you should use lei because the situation requires to be more formal, you need to learn how to say it correctly. The word lei is also a pronoun that means “she”, and this is probably the first thing that gets you confused. Indeed, the polite and formal lei is used for both men and women. It takes a little mental effort to go past the initial difficulty of using the feminine for men and the third person instead of the second, but you can get familiar with it very easily. You can hear very often people say “Per lei, signore?” for example at a restaurant – this translates as: For you, sir?. Lei + the masculine formal way of addressing men. This is not wrong, just polite! 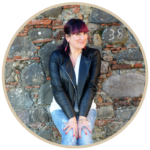 Basically, we have just said everything you need to know grammar-wise: lei follows the same pattern of a feminine third person singular. So you will say: lei pensa, lei fa, lei crede, lei viene, etc. (you may not always need to repeat the pronoun, though). YG: Good morning sir, how can I help you? EG: Good morning young lady, I would like a greeting card for my wife’s birthday. I would like you to focus on a few more things that you can notice in this example (look at the colored words and the italicized words). Our two friends say buongiorno and not ciao. 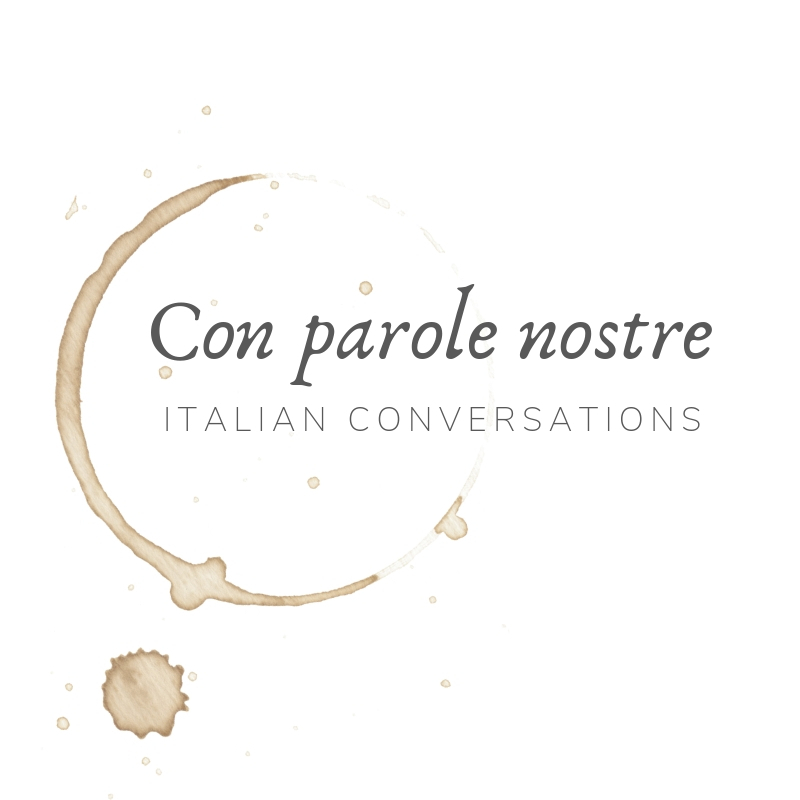 When you want to be polite in Italian, you need to say buongiorno (and buonasera) instead of the very informal and colloquial ciao, even if you are talking to a younger person. 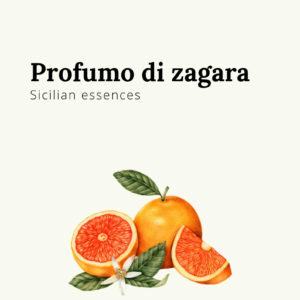 The senior customer says “signorina”, this is a rather old fashioned word that is no longer used. 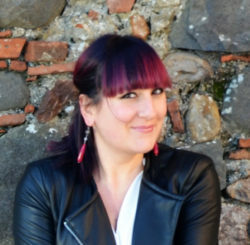 But there are cases where you can listen people saying it though: when an older person refers to a very young girl, or when someone wants to be funny and calls their single women friends “signorine”. Until about 30-40 years ago signorina was the term that defined unmarried women, regardless of their age; now we prefer to say the politically correct signora in all cases. When you want to ask for something politely, you have to use the conditional mood. In our examples the gentleman says “vorrei” (verb volere). 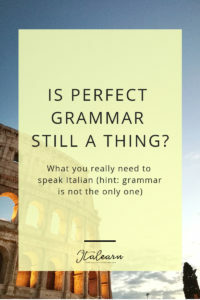 Going straight with the present indicative is considered too aggressive (io voglio). Learning the conditional is usually reserved for more advanced stages, but even as beginners you should learn a few phrases, just to be able to communicate effectively and politely at the same time. 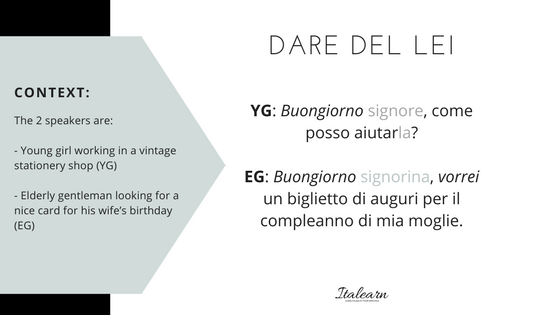 Vorrei is usually the only verb you need to remember when you are ordering or buying something. 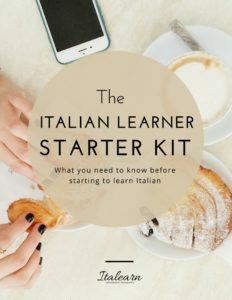 There are no doubts that it is important to be polite and to be formal in some circumstances, but more and more people in Italy prefer the informal tu over the lei even in situations where it is required to be a little more formal. I have already talked about school, but even the workplace is now becoming less formal and ceremonious. Many supervisors or managers are happy to be in first name terms with their employees. It also very common to be greeted with a ciao in many shops, bars, etc. because it is more friendly and probably the owners of those places think it helps in making their customers to feel at home. 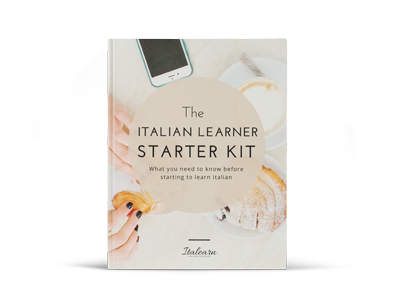 If you have Italian friends who are not yet over 50, try talking to them using lei. At least 90% of them will yell at you: I’m not that old! Yes, some people feel offended by the use of lei because it makes them feel old, so you may want to ask: ci diamo del tu o del lei? Just to avoid any misunderstanding about age. CULTURAL NOTE: in southern Italy, especially in the area of Naples, the most common polite form to use is voi (you, second person plural). As with lei you need to make the verb agree with the subject, so voi dite, voi pensate, voi sapete, etc. Think of the French vous to understand how the voi works. 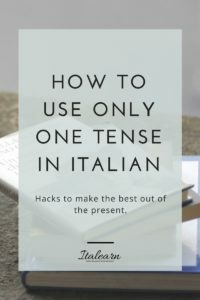 Feeling hopeless with Italian? Try my starter kit, you in?